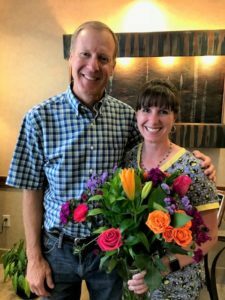 Michele Celebrates 20 Year Anniversary with Dr. Albers - Mark T. Albers, D.D.S. An office milestone – Michele reached her 20 year anniversary of working at our office! We appreciate our staff! Michele currently runs our front desk but that isn’t where she started. Back in 1998, Michele became Dr. Albers’ dental assistant when her aunt, then Dr. Albers’ assistant, temporarily stepped away from assisting to raise her daughter. Michele assisted Dr. Albers for over 16 years, making the move to the front desk in late 2014. The experience she gained as an assistant translated well to her new position. It gave her the background to be able to answer questions from patients, to know how long to schedule appointments for different problems or emergencies, and to continue her interaction with the many patients with whom she developed relationships while working as an assistant. We’ve always said that one reason for our success is our staff. We value the long-standing relationships developed over many years between our staff and our patients. And, patients appreciate coming to an office where they are known and valued. Our goal is always to make our patients feel at home when they visit our office. When you’ve seen the same smiling face for 20 years, it’s easy to feel at home. We hope you will tell Michele congratulations on her anniversary the next time you’re in our office.